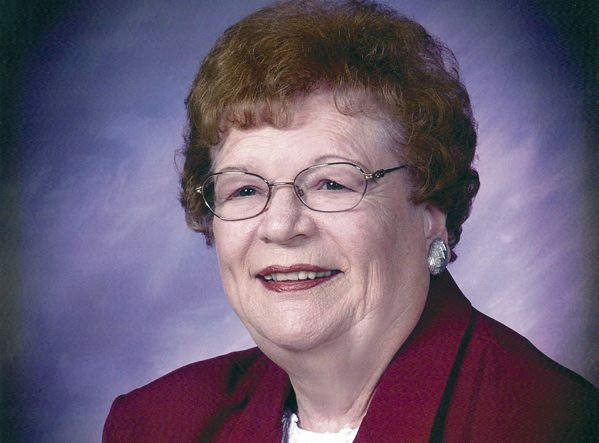 Bonita “Bonnie” Weidauer, age 89, of Balaton, Minnesota, died on Saturday, February 2, 2019, at Ava’s Hospice House in Sioux Falls, South Dakota. Memorial Services were held at 11:00 a.m., Wednesday, February 6, 2019, at Trinity Lutheran Church in Balaton. Interment will be at a later date in the Trinity Lutheran Cemetery. Bonita Belle Peterson was born May 31, 1929, to Marlin “Red” and Beatrice (McDaniel) Paterson in Balaton, Minnesota. She was baptized and confirmed in the Methodist Church and graduated from Balaton High School with the class of 1947. Bonnie then attended beauty school in Mankato before returning to Balaton to work in the local café. On July 15, 1955, Bonnie was united to marriage to Vernon “Bud” Weidauer. The couple made their home in Balaton while Bonnie worked as a school secretary. They were proud members of Trinity Lutheran Church where Bonnie served on the church council for many years. The couple enjoyed camping, traveling to Arizona and occasionally Las Vegas. She and Bud shared over 46 years of marriage together before his death in 2001. Bonnie inherited her strength and generous spirit from her mother. She always has a very giving nature and looked after the community children as if they were her own. She had a special place for animals, especially her pet cocker-ginger. An avid Minnesota Twins fan, Bonnie spent countless hours following her favorite team. Above all she cherished her faith and her church which fostered so many enduring friendships. Bonita Weidauer died on February 2, 2019, in Sioux Falls, South Dakota. She reached the age of 89 years, 8 months, and 2 days. Blessed be her memory. She is survived by cousins, nieces, nephews, and those who cared for her. They include Ronnie Almjeld of Ron & Marcia McDaniel, Dean McDaniel, and Nyla Nordvick. Also, special friends: Jerry & Beth Terhark, Kent Henkel, Kevin Henkel, and Orlin Lustfield. Bonnie is preceded in death by her parents; husband, Vernon “Bud” Weidauer; son, Dwight; and dear friend, Murlaine Henkel. In lieu of flowers, memorials are preferred to Trinity Lutheran Cemetery Fund or the Balaton Fire Department. Guest book and tribute wall available online at www.hamiltonfh.com.